The Legacy of Muhammad Ali | Kid Reporters' Notebook | Scholastic Inc. When Cassius Clay was a 12-year-old boy growing up in Louisville, Kentucky, someone stole his new red bicycle. Cassius went to the police station, vowing to “whup” the thief. An officer named Joe Martin befriended the upset child. Martin, who was also a boxing trainer, suggested that Cassius learn how to fight first. Those early lessons set Cassius on a path to becoming one of the most legendary athletes in history. By 22, Clay was already an Olympic gold medalist and the world heavyweight boxing champion. After converting to Islam, he changed his name to Muhammad Ali. Ali inspired people everywhere with his confidence and poetic way of speaking. When he turned his attention to activism, he had a big audience. 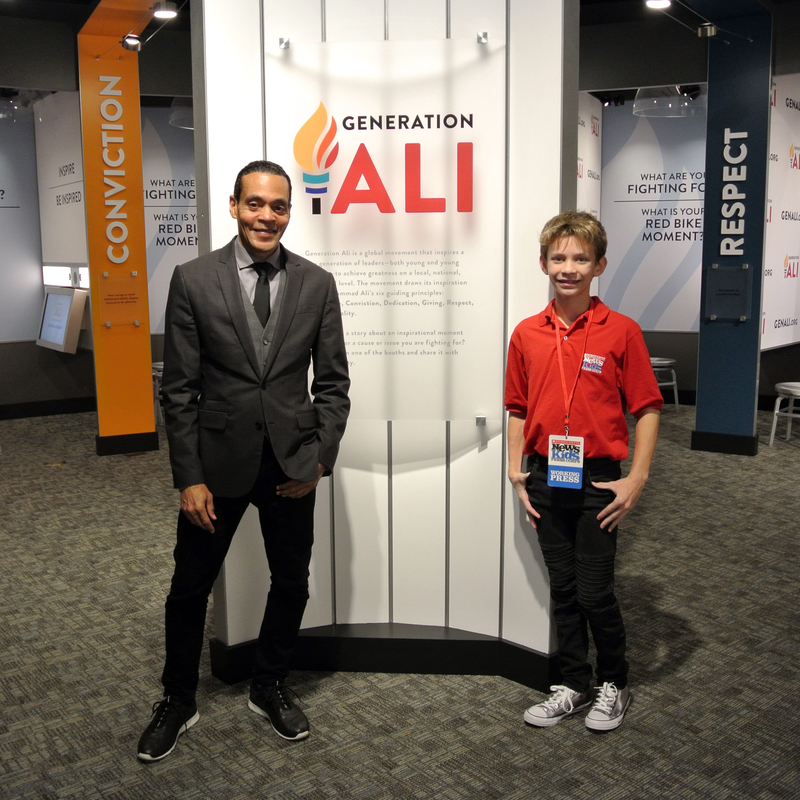 “One of the things that people don’t realize about Muhammed Ali is that he was in his mid-twenties when he burst onto the world stage, not as a boxer but as an activist,” said Donald Lassere, president and chief executive officer of the Muhammad Ali Center in Louisville. During my visit to the center, Lassere explained that Ali began his social justice efforts by vocally opposing the Vietnam War. Although the war was unpopular with many people, he was often criticized for his views. Ali stood firm. He dedicated his life to speaking out against racism, intolerance against Muslims, and other injustices until his death in 2016. Students at the Ali Center in Louisville, Kentucky, work on a project together as Leo looks on. Kids around the world are also involved. Hadiqa Bashir is the youngest person ever to receive the Muhammad Ali Humanitarian Award. She won the prize in 2015, when she was only 13. Hadiqa, who lives in Pakistan, campaigned for the rights of girls, many of whom are victims of domestic violence and forced into marriage at an early age. “She risked bodily injury on a daily basis because of the issues she was bringing forward,” Lassere said. The Ali Center is dedicated to the boxing legend’s ideals—taking an active role in the community and helping to create social change. Who knows, maybe another “GOAT” (Greatest of All Time) is out there. Muhammad Ali died in 2016, but his legacy lives on through the young people who participate in programs at the Ali Center.